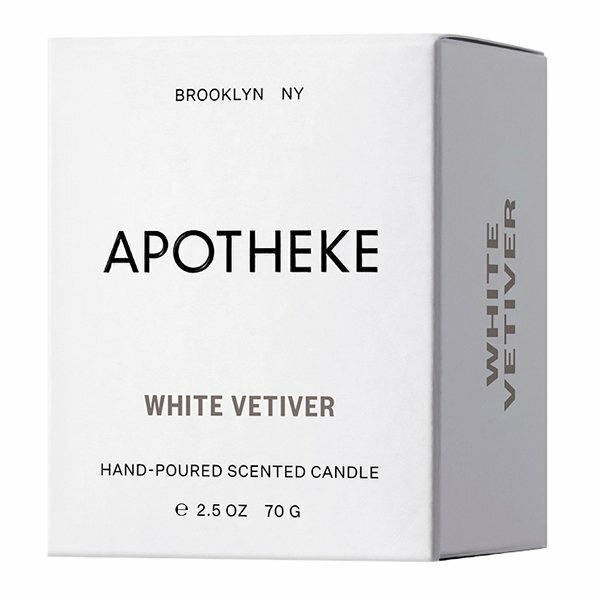 Apotheke White Vetiver Candle is taking a walk on the darker side with the ultimate fresh woody scent influenced by all things adventurous and alluring. Top: Eucalyptus, Ginger Root, Sugarcane. Mid: Cashmere, Lilac, White Balsam. Dry: Vetiver, Sandalwood, Patchouli, Amber, Cedar. Apotheke Studio Candles are a curated collection of fine fragrances candles inspired by the dreamers, makers, and artists that make every moment more beautiful. Made in Brooklyn of a high quality soy wax blend and with a 70 hour burn time.